Last month, when the White House released it's mid-session budget data, I posted some preliminary analysis but promised more when the underlying spreadsheets became available. Ten days ago, I posted some numbers based on Treasury Department data. 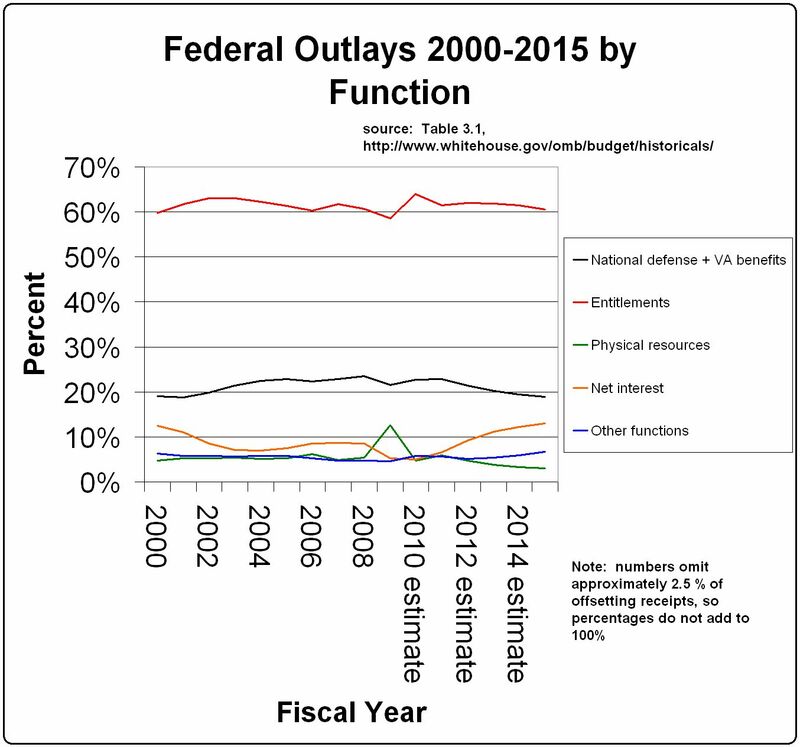 In each case, I sought to establish that entitlements, not defense outlays, are what's busting the budget. The White House numbers have been published, and I'm pleased -- though unsurprised -- to confirm my previous conclusions. I looked at Table 3.1, "Outlays by Superfunction and Function" for the Fiscal years 2000-2009 (actual) and 2010-2015 (estimated). I added Veterans benefits to defense (which includes atomic energy and other defense-related activities, see Table 3.2) to derive a more conservative tally of defense spending. Caution--because I ignored some offsetting receipts (which amount to no more than 2.5 percent of outlays), my shares do not total to 100 percent (but are off by a consistent factor). But these numbers include spending both "on-budget" and "off-budget." As is obvious, the biggest spending component isn't defense, but entitlements, specifically (see Table 3.1) "Education, training, employment, and social services," "Health," "Medicare," "Income security" and "Social security." Outlays for SS alone were $683 billion in 2009, but projected to rise to $900 billion in 2015, which is unsustainable. 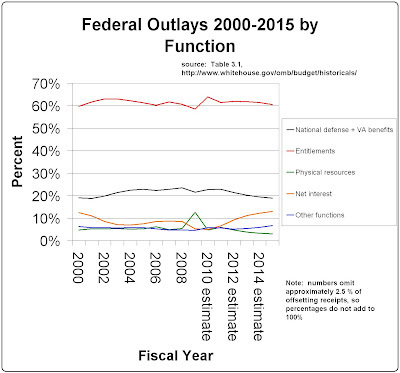 By the way, based on Table 3.2, in 2009, spending on procurement was only 17 percent of the total defense plus VA outlays. So, even within defense, hardware spending isn't the dominant component--meaning that merely zero-budgeting new weapons won't cure the deficit. Nor, as Randall Hoven shows at American Thinker, was the deficit the product of the Iraq war -- Obama's 2009 stimulus package cost almost as must as eight years of funding for Iraq. On the other hand, note the predicted rise in the share of interest payments, which is a dead-weight loss.